While the rest of you were following in the footsteps of the Ironman and cycling Highway 19 or swimming Kailua Bay, I was running the coastline, checking out Kekaha Kai State Park. 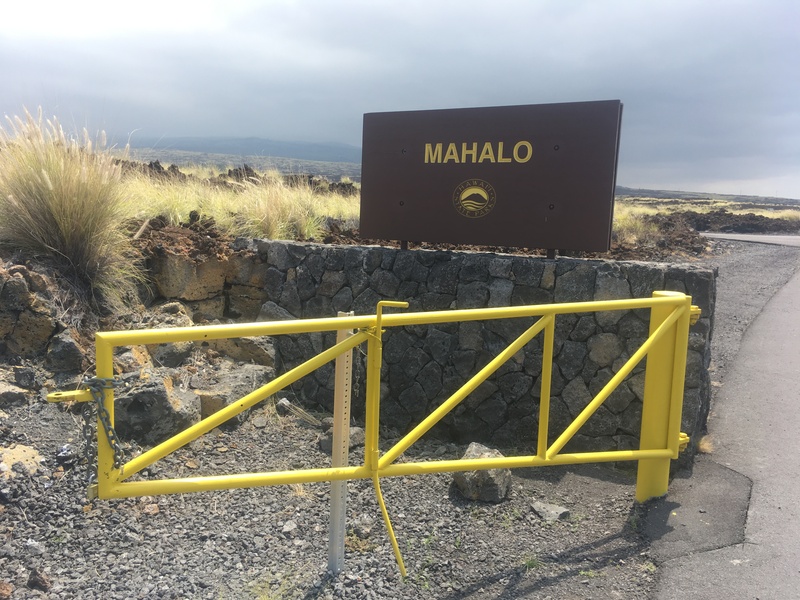 I actually wanted to drive to Volcanoes National Park to run some of the trails there, but we were staying near Kona, and the schedule didn’t allow enough time to drive to the Southeast side of the island. My trail run wasn’t so much a trail run as it was bits of running mixed with hiking and picture taking. 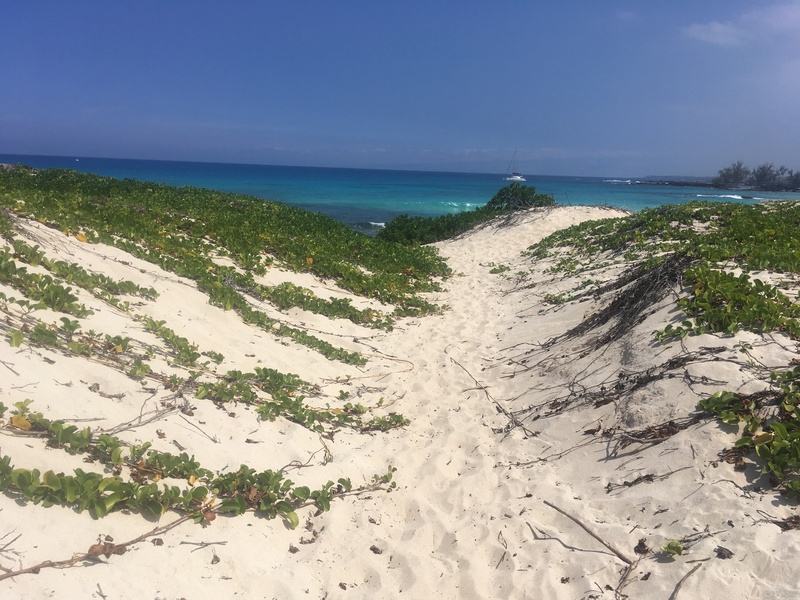 If I had it to do over again, I would have loaded up the family, snorkel gear, and beach supplies and made a day of hiking the unbelievably quiet beaches I found along the way. 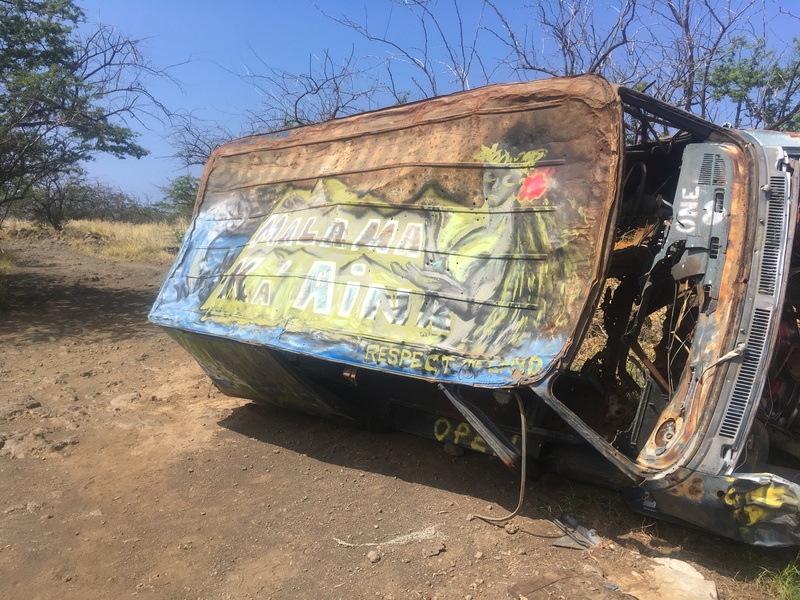 I started my run by getting a cab to drop me off at the Southern-most entrance of Kekaha Kai State Park just off Highway 19. Trying to tell the driver where I wanted to go proved amusing as he originally thought I wanted him to take me directly to Makalawena Beach. Since the drive from HI-19 to the beach is unpaved and extremely rough, you’re unlikely to find a cab willing to take you all the way in. Instead of getting dropped off near the beach, I just ran the mile or so from 19 to the beach parking area. It might be tough for a car, but it’s not that bad for running. Once I arrived at the parking area, I turned South away from Makalawena to run toward a small, black sand beach area called Makole’a Beach. The road toward the beach this direction is distinctly 4WD only, and it was much more difficult to run than the main road. The 4WD roads often have rocks in the 4-6” diameter size range bunched together anywhere the road has been washed out which is great for a vehicle but a little more challenging for a runner. 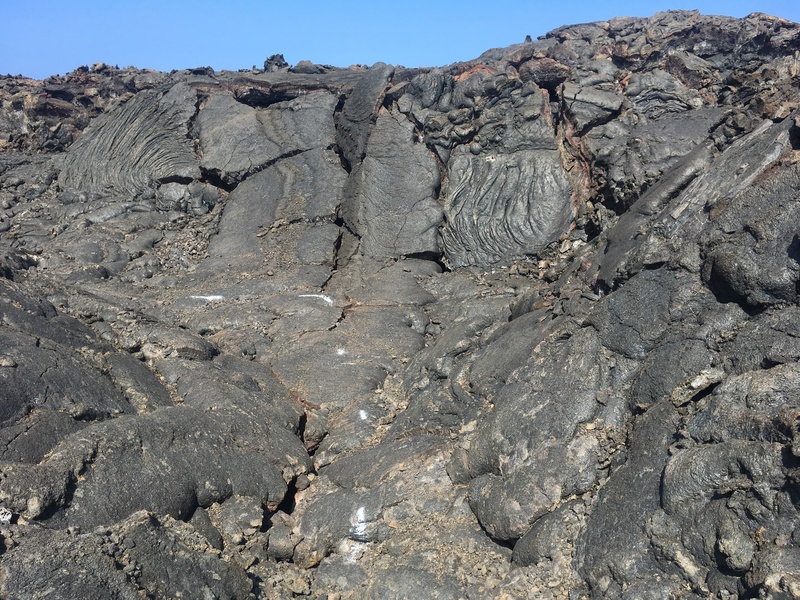 After some time on the road, I noticed white markings on the lava heading toward the beach so I blindly followed. The lava was surprisingly runnable, but that isn’t always the case. The lava in this area was smooth with cracks spaced well for my stride. In other areas, the lava was much rougher and reduced me to slow walking to keep my footing. The marked lava route eventually rejoined a road and took me to Makole’a. Makole’a was empty. At 11:00 am, I was the only person on the beach. Being the type of person who likes to avoid crowds, I was floored. I’ve never seen an empty beach…ever. It would have been nice to stay and spend some time, but this was my running time so I took a few pictures and headed north along the coast. Running from Makole’a to Mahai’ula Beach was a mix of rocks and really loose sand. If you wanted to get a better run without burning out your legs in the sand, returning to the 4WD road might have been a better strategy. There were a handful of people at Mahai’ula Beach, but it was still extremely quiet. Most people coming to this area likely hike further North to Makalawena Beach. If I’m remembering the route correctly, the hike to Makalawena is extremely rough. It’s about a quarter mile on little 4” diameter rocks. I was wearing trail shoes, and it was bothering my feet. I felt sorry for the beach goers navigating the rocks in their sandals, but the payoff had to be worth it. Makalawena Beach was so nice that I texted my wife and teased that I was just going to stay for the rest of the day. From Makalawena, I mixed some coast line running with some 4WD road running. At times the coast line slowed me to barely a crawl while I worked my way around tide pools, and at other times I was running on paths through the trees or along small, sandy beaches. 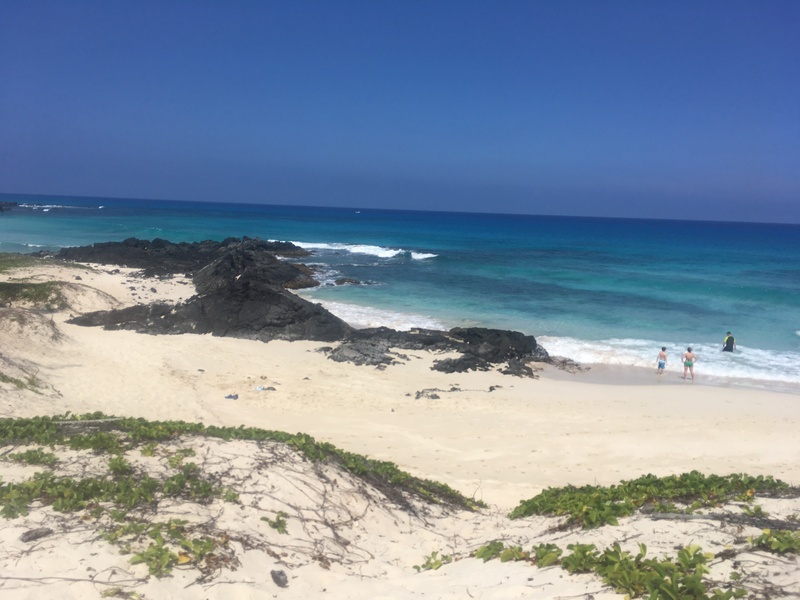 After I left Makalawena, I didn’t see another tourist until I reached Kua Bay at the North side of Kekaha Kai. The few people I did see were clearly locals either heading out for spearfishing or camping on beaches reachable only by truly off-road vehicles. The roads to these areas may not necessarily require 4WD, but you MUST have ground clearance. The smaller Subaru’s I saw earlier in my run wouldn’t have worked here, and an Outback would have been borderline. Eventually I had been out too long on too slow a route. I happened to see a car drive by out of the corner of my eye and realized I was near the paved road to Kua Bay. 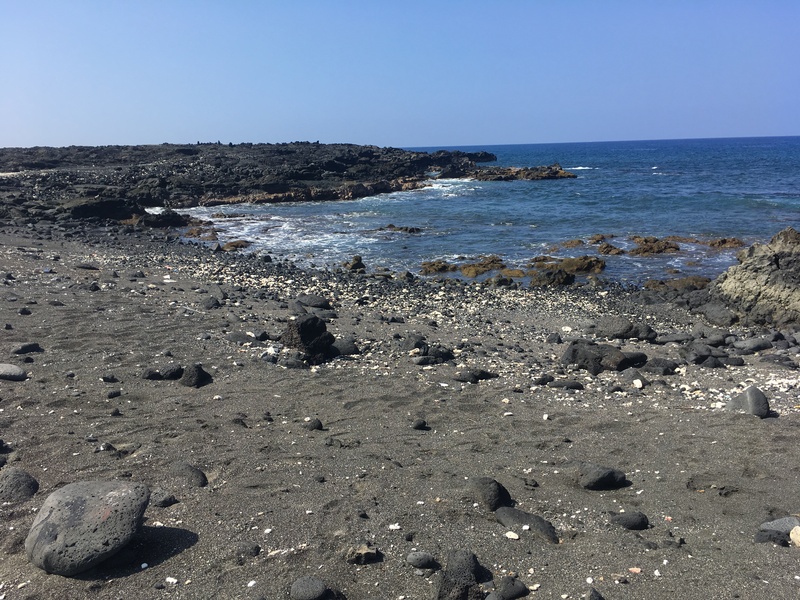 I cut across some of the worst lava rock I’ve encountered and hopped on the road for a quick half mile or so to Manini’owali Beach. Manini’owali Beach is by far the most popular beach in this park. It’s a beautiful but smaller white sand beach with much less rock in the water making it a more attractive swimming location. When I arrived around lunch time, the beach was packed. I couldn’t even run the path through the beach without risking kicking sand into sunbathers. There were coolers and towels and people on almost every square foot of white sand. I had planned to continue North, but there is a historical lava rock area just North of Manini’owali Beach with dire warnings about moving any rock. 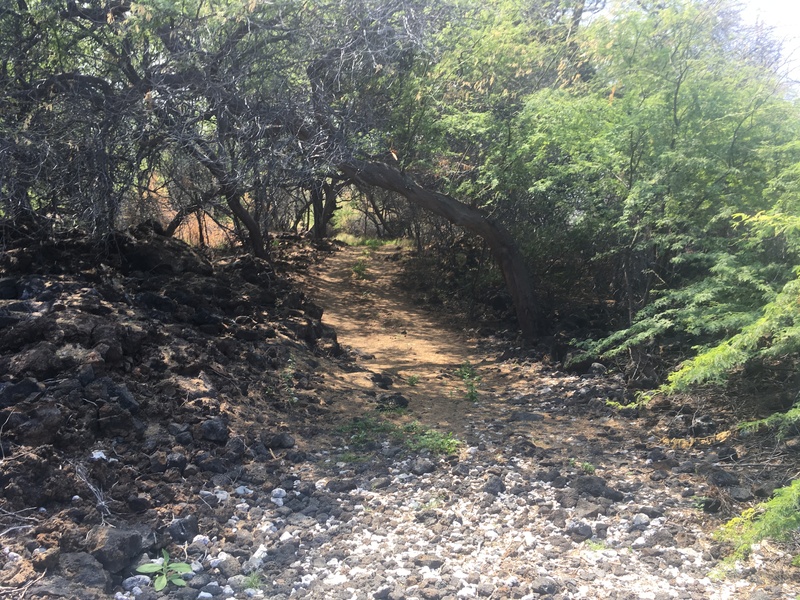 Not knowing how long it might take me to work my way through, I opted to run back out the Kua Bay access road and return to my hotel via HI-19. Even though my body was pretty well shot at this point, the roads gave me a chance to get in what turned into intervals for the final 3 miles of my run. There are probably better places to run in and around Kona and definitely on the Big Island, but I had a blast at Kekaha Kai State Park. Mahalo, Hawaii. 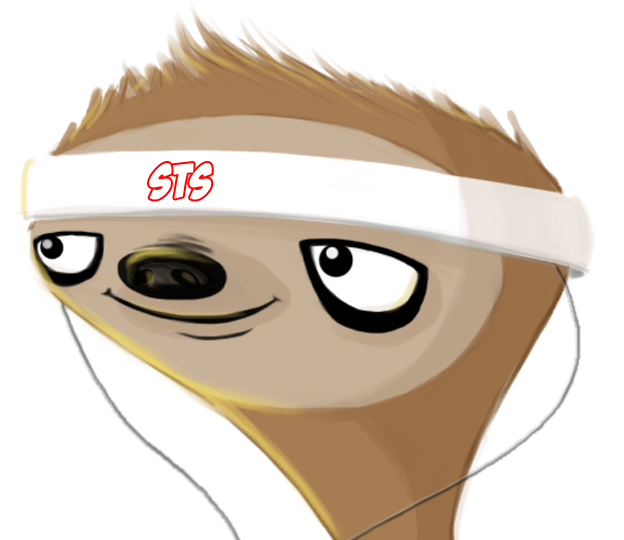 This entry was posted in Running and tagged hawaii, running, trail running by Jason. Bookmark the permalink.